Elevates, transports, and positions castings, dies, or machine accessories. 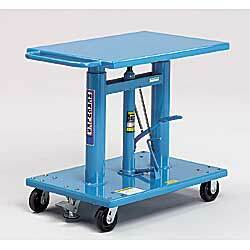 Heavy-duty lift table is available with either economcial hand or foot-activated pump. Both models are equipped with a foot-activated table release. 2,000-lb. capacity. Heavy-duty reinforcing angles and all-welded steel construction. 1/4" thick smooth steel top. Two 4" dia, stabilizing columns. Hydraulic ram gives 18" lift. Lowered height is 30"; Raised height is 48". Lower platform is securely braced and reinforced. Rubber-bottom floor lock. Heavy-duty roller bearing casters, two rigid, two swivel, 5" x 1-1/2" phenolic casters. Blue enamel finish. IN STOCK.